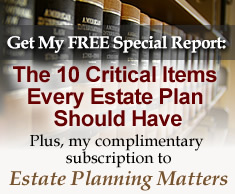 The 8 Threats to Your Estate Plan | The Levin Law Firm - Philip Levin, Esq. While working with your current clients and new prospects, please suggest that they arrange a meeting with an experienced trust and estate planning attorney in order to establish or update their personal estate plan. We would be pleased to offer your clients a Complimentary Consultation to help them avoid The 8 Threats to Your Estate Plan. Over 70% of Americans do not have a valid up-to-date Will. Therefore, make sure you ask your clients if they have their core estate planning documents in place to protect themselves and their family in the event of an illness, injury, incapacity, or death. Current individuals appointed as a fiduciary under Wills and Trusts may be deceased, relocated, or unable to serve when required. Make sure that your clients review and update their existing fiduciaries. A trust-based plan can provide your clients’ beneficiaries with valuable asset protection benefits by essentially placing a shell around their assets in order to provide protection from potential predators and creditors. Based upon current tax law, a Disclaimer Trust Plan can save families over $345,800 for married couples with collective assets over $2 million, upon the passing of the surviving spouse. When properly designed and implemented a Life Insurance Trust can insulate the death proceeds of a life insurance policy from Federal estate tax consequences that can range from 37% – 55%. Business owners should have a business succession plan, or “Business Will.” When properly designed and adequately funded, a deceased owner’s family can receive fair value for the decedent’s share of a business, and surviving business owners will be in a much better financial position to continue the business enterprise. Retirement Plan Trusts can ensure that your clients children stretch-out their Inherited IRAs, to create a lasting legacy, instead of cashing them out upon receipt, with adverse income tax consequences. Asset protection benefits for the beneficiaries are also available through use of a Retirement Plan Trust. Experience reveals that taking a team approach helps our clients to better see and allow us to solve their financial and estate planning concerns, providing a win-win for all parties. At The Levin Law Firm, we strive to provide caring and compassionate client service. We want our clients to know that we are here to take care of them by first listening to their unique concerns and goals. Only then, can recommend viable estate, trust, and tax planning strategies designed to achieve the goals and objectives of our clients. Every client is different, and each unique situation presents its own estate planning challenges and opportunities. We encourage you to visit The Levin Law Firm website, which contains easy-to-understand trust and estate planning topics that can help your clients plan today to protect and preserve their estate. Feel free to print any page, bookmark it to return later, or forward a copy to your clients, along with your friends, family members, and colleagues. At The Levin Law Firm, we try to make the estate planning process as simple and convenient as possible. When your client is ready to schedule their initial consultation, our Estate Planning Fact-Finder contains valuable tips on how to prepare for their Estate Planning Consultation. If you would like to discuss a particular client situation, or arrange a consultation on behalf of your client, please contact Laura or Ginni at (610) 977-2443.